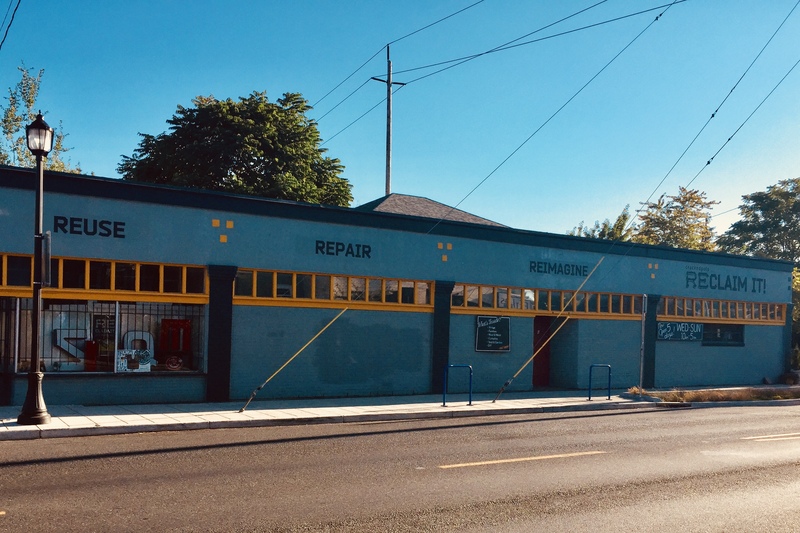 While on a recent vacation, I walked past a thrift store with the words, “Reuse, Repair, Reimagine, Reclaim It!” emblazoned across the outer walls of the building. I was so struck by these words I paused to take a photo. 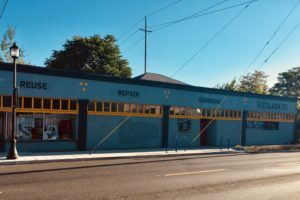 Although the thrift store’s slogan likely referred to material goods, my grief counselor brain saw a powerful metaphor for the grief process, the experience we all go through as we continually sort through the changes in our lives. As part of a recent move, I found myself in the midst of a significant decluttering project. I spent many hours on my knees in my bedroom, sorting through old memorabilia. Folders filled with notes from my middle school buddies, carefully folded and passed to me in the hallway between classes (in the days before cell phones), bags full of shattered pieces of colored glass (remnants from a mosaic craft project), and a gallon of glow-in-the-dark bubbles were among the oddities I uncovered. Like my material sorting project, grief is an emotional sorting project. After a death, memories may wash all over you, or they may come a few at a time. Each memory may bring with it a new emotion, and perhaps a renewed feeling of loss. In sorting through the memories of life before death, as well as reminders of the current grief, there are decisions to be made. What of that past life can be used in the future? What needs to be let go? To reclaim the past, what modifications need to happen? REUSE: While sorting through the past, certain elements may simply remain a part of you. As you navigate your new life, those elements may be a grounding force that helps you feel connected to your past. REPAIR: Certain past experiences and memories may require some repair before they are ready to become a part of you. While the past cannot be erased, memories can be healed. Identifying elements of your past that need repair may be a clue that you are ready to reflect on them and perhaps share them with a trusted friend or counselor. REIMAGINE: Things are not the same as they once were. Traditions you shared with your loved one may need to be reimagined. If a pastime from your past is something you want to hold on to, how can it be reimagined in a way that feels doable in your new circumstances? RECLAIM: As you continue to sort through the remnants of your life before the death, the work of sorting may help you to feel a renewed sense of hope. The difficult work of identifying and letting go of that which is truly gone will allow more space in your emotional storage to reclaim the parts that will empower you to move forward. Grieving allows us to heal, to remember with love rather than pain. One by one you let go of things that are gone and you mourn for them. One by one you take hold of the things that have become a part of who you are and build again. How is your sorting process going? What has been let go? What has been reclaimed, reimagined, reused, or repaired?